Phifer has carved a niche in today's cut throat competitive market. We are engaged in providing our clients with Aluminum / Fiber Glass / Pet Resistant Screen from Phifer. Also, these products are result of technological innovations and designed as per latest designs in market. Moreover, these products are stringently checked on various parameters so as to offer only flawless range to clients. Additionally, our clients can avail these products at highly reasonable prices. We welcome queries from Tamil Nadu including Chennai, Madras, Coimbatore, Kanyakumari, Nilgiris, Tirupur, Vellore, etc. Phifer is the largest producer of insect screening, sun control fabrics, designed fabrics, & engineered fabrics in the world. 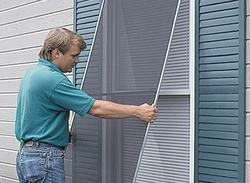 Phifer has the most complete line of window screening products in the industry. Sales history to over 100 countries. Door-to-door shipment world-wide.